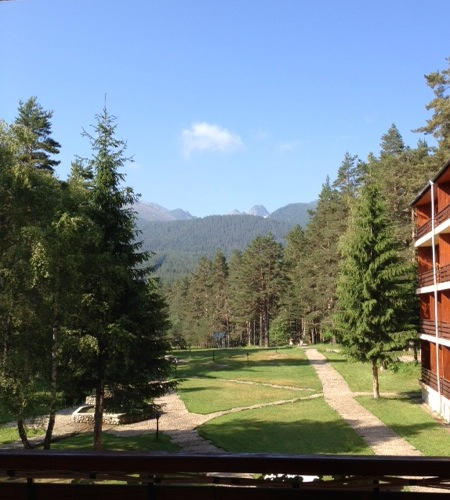 As a kind of homage to the recent post of my colleague, I too am writing from a conference set in the mountains. I’m in the Rila Mountains in Bulgaria. The name apparently comes from Thracian and refers to the abundance of glacial lakes that the mountains contain. So far, I’m a day and a half in, and have enjoyed the talks so far. The conference’s main theme is on theoretical nuclear physics, which is apt, since that’s what I do, though it means that some of the talks have been pretty heavy with equations. Even as a theorist, I can’t always digest that many equations that quickly. The conference kicked off with an interesting talk about the state of the nuclear force. Forces such as gravity, or the electrostatic force are reasonably well understood. They way they work from a classical physics point of view is straightforward enough, and there are some very well-developed theories of gravity (general relativity) and electricity (quantum electrodynamics) that work well and give very accurate predictions, though I do not claim that there is still not much to learn about both. The situation in nuclear physics is a bit different. The nuclear force, quite different in cause from the electric or gravitational forces, has been studied for around the last 80 years – since the discovery of the neutron. What was at first thought to have been a fundamental force between protons and neutrons (collectively nucleons), turned out to be the residual part of a very strong interaction between the underlying quarks within the nucleons that leaked out to allow protons and neutrons to stick together in nuclei. In that sense, it is rather like the van der Waal’s force that allows unpolarised atoms and molecules to stick together. This also accounts for its complexity, and we still are fighting to understand nature at the level of the interface between the scale at which the nucleon can be considered as a basic entity, and that at which we must think about the underlying quarks. The good news is, we are making progress, as I learnt in yesterday’s talk.